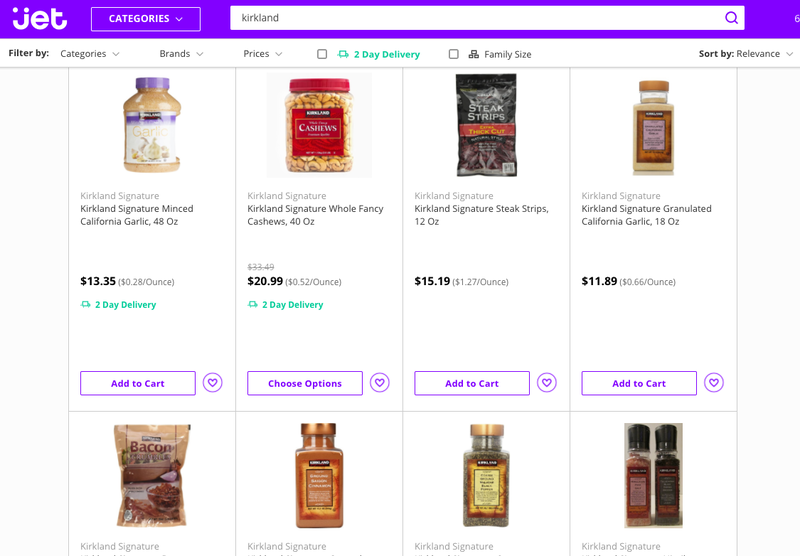 If you like Costco’s Kirkland Signature line of store-brand products — encompassing everything from laundry detergent to vodka — but aren’t a Costco member, you’ve had the option of buying some Kirkland items online at Jet.com. But now that Walmart owns Jet, those Kirkland items will be going away. A rep for Jet confirmed to Bloomberg that the site will be phasing out its inventory of Kirkland products, though it will still allow third-party Jet.com marketplace sellers to continue selling Kirkland stuff. Despite calling Walmart home now, Jet has a history with the Kirkland and Costco brands, Bloomberg reports, as Jet co-founder Marc Lore took a page out of the members-only warehouse playbook when creating his e-commerce company. As you might remember, when Jet launched in 2015 it was as a sort of online members-only warehouse club, with customers paying memberships and buying products in bulk for a discount. When that business model failed to take off, the company ditched its $50/year membership system. Still, the site was apparently somewhat popular with Costco customers, as Bloomberg reports that Jet accounted for 5.5% of Kirkland’s online sales in the first half of 2016. While it’s taken nearly a year for Jet to drop Costco’s brand, it hasn’t taken that long for the company to pick up some of Sam’s Clubs’. Bloomberg reports that Sam’s newly pared down house brand, Member’s Mark, has already been integrated into the site. As for Costco, the company’s chief financial officer tells Bloomberg that “given who acquired them” he wasn’t shocked that Kirkland’s products were being removed from the site.